pitching a fit, throwing a hissy. From Traveler in Paradise: New and Selected Poems (PEARL Editions, 2004). 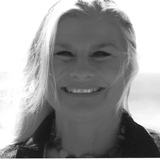 Donna Hilbert writes and teaches private workshops. Featured in the documentary, "Grief Becomes Me: A Love Story," she has seen her poems published in both French and Italian, and her book, The Green Season (World Parade Books), a collection of poems, stories and essays, will appear in a second edition in early 2012. Donna lives on the Long Beach, California peninsula where the creatures and scenery make her grateful on a daily basis. Learn more at www.donnahilbert.com. I like this poem a lot! Gotta read it out loud (like all poems) to let your mouth have fun. Wow! I feel as if I have gone home!